Maintenance Instructions For Mark 18 and Mods. Torpedoes, O.D. 8093, describes maintenance for the electric torpedo when carried on war patrol. These instructions, prepared by the torpedo personnel of U.S. Naval Submarine Base, Pearl Harbor, for the routine care and upkeep of Mark 18 torpedoes in submarines on war patrol represent a great amount of study, work and experimentation on the part of shop personnel. In addition, many of the instructions are the result of lessons learned the hard way in actual service by our submarines on patrol. There is no superfluous padding in these instructions - every step is important. If any two things are to be stressed above others in caring for Mark 18 torpedoes, they are water-tightness and care of the battery, Therefore, make sure all handholes are absolutely water-tight and batteries are kept clean and free of grounds. The electric torpedo is a new and valuable weapon -- learn all you can about it. Take the best of care of it and it will pay off with Jap ships sunk. The Mark 18 Mod 1 and Mark 18 Mod 2 torpedoes now being issued to the service contain certain improvements in design and material which differ from the Mark 18, and required revision to the original pamphlet published by Commander Submarine Force, Pacific Fleet. 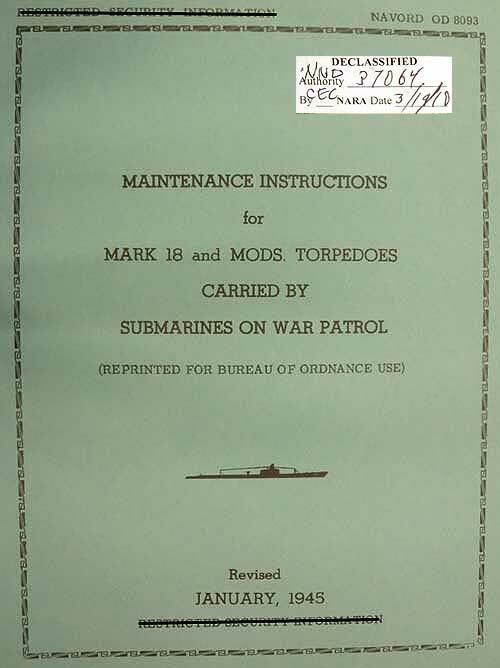 The following information concerns the Mark 18 Mods 1 and 2 torpedoes and is to be used as a supplement to the attached pamphlet. additions of water. The height of electrolyte at the time of issue should 7/8" above the baffle with a specific gravity of 1.255 to 1.265. The open circuit voltage when fully charged is 152-154 volts. The battery contains a large hollow vent cap which permits turning to 90° on either side without spillage of electrolyte. Batteries should not be left tilted for more then five (5) minutes at a time. (b) The Mark 18 Mod 2 torpedo contains the same battery and propulsion unit as does the Mark 18 Mod 1, however, a change in position of the charging socket from the midship section to the after end of the afterbody on the upper port side under a water-tight plug and gasket necessitated the designation of a new modification. The new charging unit is of the twist-lock type. Two additional hydrogen burners, which are wired in series with the charging line, permits the charging of the Mark 18 Mod 2 while in the tube and completely sealed. The Mark 2 is so designed as to provide longer path to grounds and permit easy, quick cleaning while in the battery compartment. The battery is divided into two (2) sections to facilitate loading, and only one (1) jumper is required between sections. Added safety is obtained as the result of lower voltage between adjacent terminals. (a) Hydrogen: Since these batteries evolve hydrogen at a rapid rate at all times, the procedures outlined in section 2 must be carefully followed in order to guard against the danger of explosion. (b) Battery Charging: Detailed battery charging instructions are given in section 3 and must be thoroughly understood in order to prevent possible damage to the batteries or injury to the operating personnel. (c) Accidental starting: The series motor in this torpedo, if started without load, will completely wreck itself in a short time. Therefore, the stop valve must be closed and the starting lever and propeller locks installed whenever the torpedo is withdrawn from the tube. (d) Charging Valve: Some of the earlier torpedoes have no check valve on the charging valve. Consequently, the stop valve must always be closed before the charging plug is removed. (e) Stop Valve: The stop valve must be opened wide when the torpedo is loaded into the tube. Do not open and back off a fraction of a turn as with air torpedoes. Both the stop valve spindle and the charging plug should be checked for leaking air with light oil prior to loading the torpedo into the tube. (f) Tilting: This torpedo should be kept in horizontal position whenever possible in order to minimize the danger of spilling acid from the batteries. It should not be kept tilted any longer than necessary while being loaded aboard the submarine and should never be rotated more than 90 degrees from the running position. (g) Corrosion: The steel rudder connections in the tail cone must be kept free from corrosion to insure proper action of both the vertical and horizontal rudders, The freeness of both rudders should be checked by hand whenever the tube door is opened. Later torpedoes will have corrosion resistant rudder rods. (h) Watertightness: This torpedo is exceptionally watertight when the handhole covers are properly secured with good gaskets. The large rubber handhole gaskets should be carefully cemented to the handhole covers before the latter are installed. Care to insure watertight handholes in electric torpedoes cannot be stressed too much. (i) Flooding: Whenever water is found In the afterbody, remove a battery connector under No. 3 handhole and check all the electrical circuits for grounds. Be sure the inside of the charging socket is clean and dry. (j) Hand disconnect Switch: The hand disconnect switch has been removed from all torpedoes. Whenever it is desirable that the electrical circuit be broken, a battery connector under No. 3 handhole may be removed. (k) Cell Connectors and Terminal Posts: The cell connectors and battery terminal posts are carrying almost the maximum current they are capable of carrying during the run of a torpedo. Therefore, they must be tight and in good condition. Extreme care must be taken to prevent the dropping of tools, spider, etc. into the battery compartment as even slight damage to the connectors or terminal posts from this cause will give a failure upon launching. It is better to jump out a slightly damaged cell than to take a chance on a battery failure which is almost certain to result from inadequate current-carrying capacity. Caution: Be sure that a cell to be jumped out has been completely discharged before the cell jumper is installed. (a) A mixture of hydrogen and air which contains from 4% to 74% hydrogen will explode if ignited by a spark. Such a mixture is formed in the battery compartment of this torpedo if the handhole covers are secured in place and the hydrogen eliminator is not operating. At 82 degrees F, a freshly charged battery will produce a 4% concentration of hydrogen in about two (2) hours. This rate gradually slackens off until, twenty-four hours later, the same battery will take about four hours to produce the 4% mixture. At 100 degrees F this rate of hydrogen evolution is about doubled, while at 65 degrees F, the rate is about half that at 82 degrees F.
(b) Since hydrogen is continuously being evolved at all times, every precaution must be taken to insure against explosions. Torpedoes in the racks should always have No. 4 handhole cover removed in order to permit the natural diffusion of the hydrogen as it is formed. Wire mesh should be bolted to the No. 4 handhole spider to prevent foreign objects from falling into the open handhole. Since hydrogen is being evolved at the maximum rate toward the end of a freshening charge, one or two additional handholes may be left open at this time. (c) Each Mark 18 torpedo issued by this force is equipped with a hydrogen eliminator to be connected as soon as the torpedo is loaded into the tube. It consists of a screen enclosed electrically heated wire which keeps the hydrogen concentration below the explosive limit by catalytically burning it to water as soon as it is formed. It is effective as long as the battery compartment contains enough oxygen to support this catalytic combustion. Consequently, the air in the battery compartment must be changed periodically to permit the hydrogen concentration from building up after the depletion of the oxygen supply. For even though no explosion can take place when no oxygen is present, the hydrogen must be eliminated to prevent one from occurring after the torpedo has been fired, when an ample supply of oxygen will be discharged from the air bottles into the afterbody and through the poppet valve into the battery compartment. connections have been made through the use of the heater circuit wiring in the torpedo. The heater relay and thermostats have been removed. The power furnished by the boats' 115-volt A.C. circuit through the new Ward Leonard burner panels. The panel consists, essentially, of a transformer having the means to change its secondary voltage over a range of approximately from 15 volts to 20 volts by means of a sliding contact running on a portion of the primary winding. The secondary energizes individuals circuits, which have, in series, a circuit fuse, a rheostat, an illuminated indicator and shunt, and a double pole circuit switch. In addition, a switch is provided which allows the current in each circuit to be read. The purpose of the individual compensating rheostats in each circuit is to permit adjustment of each circuit to exactly the same resistance as all other circuits. The adjustable voltage transformer supplying these circuits may then be used to maintain all circuit currents at 4.75 amperes. (e) The current flow in the hydrogen eliminator is critical. It should be maintained as near to 4.75 amperes as possible. If it is allowed to fall below 4.50 amperes the hydrogen concentration may become excessive, while the life of the wire will be shortened if the current exceeds 5.00 amperes. The current should be checked whenever a switch in one of the hydrogen burning circuits is closed. This will normally be done after loading or ventilating a torpedo. be removed with care when the torpedo is ventilated. It is easily damaged by rough handling and the water-tightness of the torpedo in the tube depends to a large extent on the integrity of this gasket and the care with which both the gasket and plug are secured. The gasket is easily removed by inserting a small penknife between the edge of the gasket and the body of the fitting and lifting the gasket out from the side. (g) Since the duration of the oxygen content of the battery compartment depends on the rate of evolution of hydrogen, it will vary with the temperature and state of charge of the battery. In order to be absolutely safe with battery temperatures around 90 degrees F. these torpedoes should be ventilated twenty-four hours after being loaded into the tubes and every forty-eight hours thereafter. See section 7 of these instructions (forty-eight hour routine for torpedoes in tubes). (h) If the above ventilating instructions are followed, the eliminator will function properly as long as the indicator light burns normally. If a light goes out, either the light or the eliminator wire has burned out and must be replaced. If a light burns with exceptional brilliance, investigate to make sure that the shunt around the light is properly connected. If all the lights go out at once, it is probably due to power failure. If, for any reason, the wire remains out for more than one hour, the torpedo must be ventilated before it can be turned on again. If the current is off for less than an hour, it may be turned on again without danger. However, this does not begin a new forty-eight hour safe period. (I) The hydrogen eliminator current must always be turned off before the torpedo can be ventilated, fired or withdrawn from the tube. (j) Anytime the hydrogen eliminator circuit is turned off for any reason and is to be off for more than one hour (with the battery compartment sealed) the torpedo need not be ventilated if the eliminator is turned on for ten minutes out of each hour of this period. (k) The Mark 18 Mod 2 torpedo may be charged while in the tube provided three screened hydrogen eliminators are installed. All three are identical. Two, mounted on the spiders of handholes Nos. 2 and 5, are wired in series with the charging current and are in use only while the battery is being charged. The third, as described in paragraph (d), is on continuously. Three burners installed in this manner will limit the hydrogen concentration in the battery compartment to five per cent during a seven-ampere freshening no matter how long the battery is overcharged. If the torpedo is ventilated for three minutes before and after the charge, no change need be made in the ventilating instructions for torpedoes in the tubes as described in section 7 of these instructions (forty-eight hour routine for torpedoes in tubes). (a) The Mark 2 battery is a standard lead-acid storage battery, designed to permit its full capacity to be discharged in a very few minutes. In order to obtain the high discharge rates required, a large number of very thin plates are crowded into the limited space in the battery compartment. The sediment space between the plates is small and the utmost care must be exercised in charging these batteries in order to prevent serious damage to the plates and the accumulation of sufficient sediment to short circuit two plates of opposite polarity, The Mark 2 battery is issued with an electrolyte level of 7/8 inch above the baffle and a specific gravity of 1.255 to 1.265. (b) The thinness of the plates and the high specific gravity of the electrolyte combine to produce a high rate of local action in these batteries. At 82 degrees F. the specific gravity of a fully charged Mark 2 battery may be expected to drop about twenty points a week. At 100 degrees F. the specific gravity will drop twice as fast while at 65 degrees F. it will take two weeks to drop twenty points. Since the plates become sulphated and are easily damaged if they are allowed to remain in a discharged condition for too long a period, it is desirable that a freshening charge be given whenever the specific gravity drops about twenty points. Therefore, the pilot cells should be checked at intervals at which a drop of twenty points may be expected at the particular temperature at which the batteries are being maintained, Since a twenty point drop in specific gravity is equivalent to the loss of one thousand yards in range at 82 degrees F., the battery should be charged within two days before loading the torpedo into the tube. (c) If the specific gravity appears to be dropping too rapidly check the battery tops for moisture. Excessive charging	rates result in violent gassing which tends to dislodge active material from the plates. It is very important that the battery tops be kept clean and dry at all times. At the end of each freshening charge, any spilled acid should be neutralized with a paint brush moistened in sodium bicarbonate solution and dried carefully with a clothe Then the battery circuit should be checked for grounds. (1) Be sure switch on charging panel is in the "off" position and rheostat knob is turned panel to the position of maximum resistance. (2) Inspect interior of charging socket for moisture. (3) Insert charging plug into charging socket. Mark 18 and Mark 18 Mod 1 torpedoes have the charging plug in the midship section, while Mark 18 Mod 2 torpedoes have a twist-lock charging plug in the afterbody. (4) Read open circuit voltage on charging panel and enter in record book. If polarity on voltmeter is wrong charging plug is connected backwards, and switch must not be closed until connections are reversed. (5) Close switch on charging panel and adjust rheostat until desired charging rate is obtained. (6) Start charge at a rate not in excess of seven amperes. This rate should be reduced if excessive gassing, foaming, or heating is evident. The battery temperature should in no case be allowed to exceed 110 degrees F.
(7) Record current and voltage readings on the charging panel every hour until two consecutive readings of charging voltage show no further increase. At that time the charging voltage should be between 188-195 volts for Mark 1ï torpedo, and for the Mark 18 Mod 1 torpedo voltage should be 172-178 volts. The final charging voltage for the Mark 18 Mod 2 with two hydrogen burners in the charging circuit should be between 200- 210 volts due to the additional resistance of the hydrogen burners. (8) Open switch an char socket panel before removing char ging plug from	Then remove charging plug. (9) Take specific gravity readings of the three pilot cells and enter in record book. CAUTION: Be sure all vent plugs are replaced tightly. (10) Clean and dry battery top and check for grounds. (e) New type submarine charging panels for the Mark 18 torpedoes have individual charging circuits and controls with two (2) circuits per panel available. New construction submarines will have two panels forward and one panel aft with a total of four (4) charging circuits forward and two charging circuits aft available. The new type submarine charging panels will have voltmeters provided for use during freshening charge. These meters will be installed as soon as procurement is completed by the activities concerned. With installations using the old type charging panel when charging two or more batteries in parallel, be sure that all switches are open in all the circuits before a connection is made or broken in any of them. Serious burns may result from failure to observe this precaution. Since the plug attached to the main charging panel is energized whenever the main switch is closed this plug should always be used before any of the auxiliary plugs. Whenever batteries are being charged in parallel the current flowing in each circuit must be carefully checked and all the currents must be adjusted so that the highest of them is not excessive. Since a fifteen ampere fuse is installed in the charging panel, the total current flowing can never exceed this amount. (f) The cells in the battery are numbered from 1 to 72, starting with the starboard after cell as number one and the port after cell number seventy-two. The pilot cells now in use are numbers 1, 13, and 60 and may be easily identified by the white-topped vent plugs. These vent plugs should always be replaced as soon as readings have been taken. extent. The effective range of the torpedo may be expected to decrease about thirty yards for each degree drop in electrolyte temperature, while the average speed from the firing point at any particular range will be reduced about one-quarter of a knot for each ten degree drop in temperature. These figures are, of course, rough approximations but are sufficiently accurate for practical use. (h) The state of charge of the battery is another factor which affects its operating characteristics. Each point drop in the specific gravity of the electrolyte will reduce the effective range of the torpedo about one per cent. The speed is affected to a lesser extent, with the permissible drop of twenty points reducing the speed less than one-quarter of a knot. (i) The new type ventilation increases the rate of evaporation of the water in the battery electrolyte to a considerable extent. It will therefore be very important to carefully watch the electrolyte level in torpedoes being ventilated by means of the ventilation fitting. Current tests indicate that watering of batteries of torpedoes being ventilated with forced ventilation will be required at intervals of not more than eight weeks for Mark 18 Mod 1 torpedoes. (j) When the specific gravity of any cell has fallen more than fifty points below the average of the other cells, a short circuit in that cell is indicated and the cell should be jumped out before the torpedo is fired. Cell jumpers are being provided all submarines for this purpose. (k) It is important that any cell to be jumped out be completely discharged (to a specific gravity of less than 1.100) before the cell jumper is installed. This may be done by mounting a 2.4 inch (0.1 ohm) length of No. 18 Nichrome V wire on a spare hydrogen eliminator spider (without the coil) and connecting the leads across the cell to be discharged. At a discharge rate of 20 amperes This specific gravity will fall about one point per minute. This discharge rate may be doubled by using two strands of wire in parallel but the connecting leads must then be able to carry 40 amperes. cell is to take the open circuit voltage of each battery section prior to each refresher charge. The variation in voltage between similar sections will show which section has a dead cell and it may then be located by individual cell tests in that section. (1) Fire the caps in the dummy detonator with the firing pin and mechanism as they will be installed in the head. (2) Check push-off of mechanism for 5 1/2 - 6 1/2 pounds. Check reflex to 2 1/2 turns. (3) Inspect interior of exploder cavity to insure cleanliness, freedom from moisture and deformation, paying special attention to deformations. Coat interior of cavity with tectyl (thin). (4) Remove Mark 8 detonator chamber from container. Retain cardboard and container for restoring detonator and boosters. Remove paraffin wrapper from detonator and safety chamber. NOTE: Some types are wrapped, later types are not. The detonator should be checked to see that it is modified by having 60-degree bevel on holder skirt. (5) See that the detonator carrier moves freely in the threads of safety chamber and note that scribe marks on the top of the carrier and the safety chamber line up when the carrier is flush with the top of the chamber. (6) Check lot number and year of manufacture. Record on card. (7) Install detonator carrier and safety chamber on unarmed exploder mechanism with all scribe lines matched and secure in place with four screws. See that idler gear is in place. (8) Remove Mark 2 tetryl booster from its container and remove paper label from it as well as possible. Install booster in booster cavity of warhead and check to see that it has a loose fit in the booster cavity. Recessed end of booster faces outboard. (9) Use a new gasket on base plate seat, securing to warhead with "Tite-Seal". Make sure seat is clean and smooth. (10) Install four guide screws equidistant around seat. (11) Lift mechanism with lifting handles and carefully insert in head. Line it up properly and insert holding screws. (12) Set up base plate holding screws evenly. (13) Conduct Leakage Test: With 8-5 and 8-7 Exploders in 18-1 or 18-2 warheads, it is necessary to plug the water passage in the head in order to conduct this test. Remove test plug in base plate. Place cofferdam on head over mechanism and secure with strap. Insert test gauge and adapter. Admit five (5) pounds air pressure into exploder cavity. Fill cofferdam with water. Look for leaks around base plate screws and gasket, diaphragm ring and impeller shaft. If test is satisfactory, drain water from and remove cofferdam. Bleed air from exploder cavity, remove adapter and test gauge and replace test plug using new washer. (14) Test impeller with spring balance. Should be 20-24 ounces. Readings should be consistent throughout one complete revolution. Do not turn more than two revolutions. (15) Witnessing officer will sign check off list. "Modified fully ready" torpedoes delivered to submarines have had preliminary and final adjustments applied and are in all respects ready for a war shot except for a few final adjustments to be made by the submarine before loading into tube. These adjustments are listed in section 6 of these instructions and are summarized on a tag attached to the tail of each torpedo. (a) Starting lever is locked in a forward position with a starting lever lock. (b) Propeller lock is in place. (c) Stop valve is closed. (d) Wire mesh is bolted to No. 4 handhole spider in place of handhole cover. (e) Remove transportation screw and put in replacement strew and washer. If the torpedo is to be racked, the pressure in the air bottles should be gauged and recorded., The depth should be set at about five feet to relieve the tension on the depth spring. As long as the torpedo remains in the racks no further adjustments will be required, except for the periodic battery charging routine described in section 3. When it is loaded into the tube, the procedure outlined in section 6 will be followed. (a) Check the following tube mechanisms prior to loading torpedo. (1) Depth setting mechanism must be in the disengaged position and set at ten feet. (2) Gyro angle setting mechanism must be in the disengaged position with the forward indicator regulator set at zero and the after indicator regulator set at 180 degrees. (3) Tripping latch must be in the "up" position. Note action. (4) Stop bolt must be flush across guide slot in "down" position. Note action by firing stop bolt with no pressure in the impulse tanks. NOTE: Steps (b), (c) and (d), which follow, may be omitted when the torpedo is loaded into the tube immediately after receipt from an overhaul activity. (b) Check the battery for dead cells and take the level and specific gravity of the electrolyte in three pilot cells and give battery a freshening charge, in accordance with the procedure described in section 3. If water is needed, one ounce should be added to each cell before starting the freshening charge. Note: The level in several cells should be checked before adding water to all cells, since sometimes only the pilot cells need water to replace spillage losses. (c) Remove propeller lock and turn propellers at least one complete turn to check freeness. Replace propeller lock. (d) Remove handhole plate from starboard side of afterbody. Work pendulum and valve of vertical steering engine by hand to be sure that valves are not frozen. Work both horizontal and vertical rudders by hand, using one hand on each rudder. Operate depth setting mechanism from zero to fifty and back. (e) Gauge pressure in air bottles and compare with last recorded reading. If pressure drop has been excessive check air lines for leaks. Boost pressure to 3000 p.s.i. Caution: Be sure stop valve is closed before removing plug from charging valve. Crack charging valve and allow high pressure air to bleed off before unscrewing plug completely. (f) Release and relock gyro. Note that the spindle snaps back sharply, that the gyro spins freely about all axes, and that the fingertrip is against the wall of the pot. (g) Set gyro angle on zero and depth index at ten feet. (h) Replace any handhole covers that have been removed. Be sure all gaskets are in good condition and all bolts and plugs are set up tight. Caution: Afterbody hand-hole nuts should be set up evenly and gently to avoid shearing studs. Then introduce low pressure air (five to ten p.s.i.) through fitting in No. 7 handhole and check all openings for leaks with soapy water. (i) Load torpedo to afterbody joint ring. Then open stop valve wide (do not open and back off 1/4 turn as with steam torpedoes). Check with oil for air leaks around stop valve spindle and charging plug. (j) Grease tail through the five fittings provided: the sylphon, the short shaft, the tail bearing and the two ends of the cross head. Also see that the gear teeth in the tail are covered with grease. Use Petrolatum, Navy Department specification 14P1. (k) Remove starting lever lock and run torpedo gently home until guide stud meets stop bolt. (l) Check tube gyro angle and depth setting mechanisms for engagement, disengagement and proper operation. (m) Connect hydrogen burning circuit. Pass cable from tail through cutting clamp on breech roller of tube and be sure cable plug is tight against seat in roller housing. Check circuit for continuity and grounds, Then energize circuit, check indicator light and make sure that current flowing is between 4.5 and 5.0 amperes. (o) Recheck check-off list to make sure that no step has been omitted. Then close tube door and tighten tail stop. (p) On "make ready the tube" turn off hydrogen burning circuit and slack off tail stop 1/10 turn. (q) If the torpedo is not fired, do not turn on the hydrogen burning circuit before ventilating the torpedo if the hydrogen burner has been off for one (1) hour or more. 7. FORTY-EIGHT HOUR ROUTINE FOR TORPEDOES IN TUBES. (a) Turn off hydrogen burning circuit. (b) Open tube door and install torpedo securing bar. (c) Remove plug and gasket from ventilation fitting in afterbody. In order to remove the gasket without damaging it, a penknife may be inserted between the outer edge of the gasket and the side of the fitting. (d) Replenish oxygen supply in battery compartment by blowing low pressure air (about 200 p.s.i.) through ventilation fitting for three minutes. Then carefully replace washer and screw plug tight. (e) Check hydrogen burning circuit for grounds and shorts. Then energize circuit and check to see that 4.5 to 5.0 amperes current is flowing. (f) Remove securing bar and work horizontal and vertical rudders by hand. (g) Close tube door and tighten tail stop. (h) Turn on the hydrogen burner circuit. NOTE: If the temperature is constantly at 95°F. or higher, ventilate each twenty-four hours. 8. PROCEDURE WHEN WITHDRAWING TORPEDO FROM TUBE. All torpedoes must be withdrawn from the tube at least once each week. Torpedoes subjected to high surface speeds, depth charging, or excessive depth with the outer door open should be withdrawn as soon as practicable. (a) Set on arbitrary gyro angle and depth while torpedo is in tube. (b) Shut off hydrogen burning current and break connections. (d) Withdraw torpedo to afterbody joint ring. Caution: Do not pull torpedo by propellers. Hook into forward openings in tail cone. (e) Close stop valve and install starting lever lock. Then finish withdrawing torpedo from tube. (f) Examine gyro and depth settings on torpedo. (g) Check hydrogen content of battery compartment by removing No. 4 handhole bolt and inserting rubber tube from hydrogen detector. Then remove No. 4 handhole cover and inspect bottom of compartment for presence of salt water. Note presence of chlorine vapor. (h) Remove afterbody drain plug. If more than one pint of liquid is withdrawn, the battery circuit shall be broken by removing a connector under the No. 3 handhole. The afterbody shall then be detached from the battery compartment and the motor removed. If wet, it should be washed with fresh water, dried for grounds and shorts by a competent electrician. The charging socket and gyro housing should also be carefully inspected if the afterbody has been flooded. Replace drain plug. (i) Examine exposed metal parts for corrosion; clean pits and rust spots and coat with Paralketon preservative. (j) Inspect Nichrome wire in hydrogen eliminator and renew if it has become brittle or seriously corroded. (k) Before reloading this torpedo into a tube, all the adjustments outlined in section 6 "PROCEDURES BEFORE LOADING TORPEDO INTO TUBE" must be completed. (1) Withdraw the torpedo and complete afterbody routine, as outlined in steps (a) through (j) above, and steps (b) through (l) of section 6, before the battery is charged. (2) Install securing bar and ventilate torpedo for three minutes with 200 lb. air. Do not replace the ventilating plug. (3) Connect hydrogen burning circuit. Pass cable through cutting clamp on breech roller of tube and be sure cable plug is tight against seat in roller housing. Check circuit for continuity and grounds. Then energize circuit, check indicator light and make sure that current flowing is between 4.5 and 5.0 amperes. (4) Charge the battery through the tail charging socket at seven amperes until two consecutive hourly charging voltage readings show no further increase (see section 3- Battery Charging and Maintenance). At that time, the charging voltage will be between 200 and 210 volts. plug from the socket and check each side of the charging socket for grounds. If more than five volts to ground is found on either side, the torpedo must be fully withdrawn and the ground located and rectified. (6) Ventilate the torpedo again for three minutes with 200 lb. air. Then turn on A.C. hydrogen burner. (7) Replace the tail ventilating and charging plugs and gaskets, remove propeller lock and securing bar, and close tube door. NOTE. At least once each month, Mark 18 Mod 2 torpedoes charged in the tube in the above manner must be completely withdrawn from the tube. Then the battery compartment handholes should be opened and the cell tops, vent caps and hydrogen burners inspected. When the handhole covers have all been replaced, the warhead joint screws should be set up tight and an overall tightness test given the torpedo before it is reloaded into the tube. 9. REMOVAL OF EXPLODER MECHANISM. (a) Remove warhead from torpedo without rotating torpedo. (b) Place warhead on chocks and rotate 180 degrees so that exploder base plate is on top. (c) Remove mechanism base screws. (d) Lift mechanism base screws. (e) Remove safety chamber and detonator, particular care being taken that the detonator is fully housed in the safety chamber. (f) Remove booster from warhead. (g) Dry all parts thoroughly. (h) In case it becomes necessary to use an exploder which has been flooded and stop (g) has been accomplished, oil the moving parts of the firing mechanism. Remove any rust and check the mechanism with a spring balance if possible. Should be 5 1/2 - 6 1/2 pounds. 10. ROUTINE FOR FIRE CONTROL EQUIPMENT DURING WAR PATROL. Before starting on patrol see that appropriate angle solver alterations have been made for use of TDC with Mark 18-1 and torpedoes and that the proper test have been run with satisfactory results. (a) Disengage gyro spindles (on zero for forward tubes and 180 for after tubes) and slew both indicator regulators to both extremes. After tests bring indicator regulators back to zero or 180 degrees and engage gyro spindles. (b) Place indicator regulators in automatic and while generating problem on TDC, check to see that indicator regulators are following correctly. On this test it is only necessary to train the gyros through small angles. When securing bring forward indicator regulator back to zero and after indicator regulator back to 180 degrees. (c) Run test problems on Torpedo Data Computer daily when practicable, particularly when enroute to and from patrol areas. (a) Ring through all fire control circuits with megger. (b) Run several position keeper check problems. (c) Run several forward and after angle solver tests. maximum run to be expected at those temperatures. Requests for additional copies of NAVORD OD 8093 should be submitted to the U. S. Naval Gun Factory, Washington 25, D.C. Copyright © 2010, Historic Naval Ships Association.